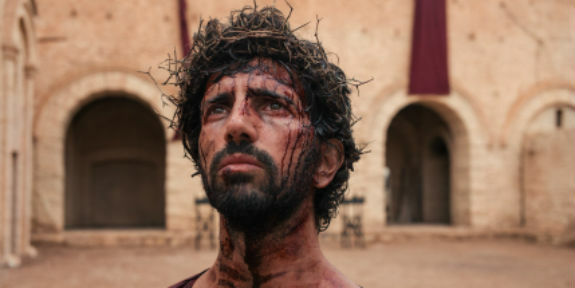 History’s ‘Jesus: His Life’: Is It Worthwhile Lenten Watching? Sorry to say it, The Bible miniseries notwithstanding, but History Channel is not always the best place to hear about Christianity. Jesus: His Life, premiering tonight, Monday, March 25, is no exception. The four-week, eight-episode series aims to tell the story of Christ (and, to its credit, it emphasizes how important it is to understand that story, even for unbelievers, if one is to understand Western civilization) through the eyes of those who knew him. The first two episodes were made available to critics — Joseph: The Nativity and John the Baptist: The Mission. There are the usual sword-and-sandal Biblical recreations, but at least actors were cast in the major roles, including Jesus, that are much more robust and expressive than the overly reverent stiffs that are too often found in these documentaries. Interspersed with the dramatic segments is an array of talking heads, including clerics and academics. It’s a mixed bag, with the clerics including the controversial Father James Martin, S.J., and megachurch pastor Joel Osteen; along with Episcopal Bishop Michael Curry (famous for preaching at the wedding of Prince Harry and Meghan Markle), Father Jonathan Morris, and Trinity United Church of Christ senior Pastor Rev. Otis Moss III. Among the academics is Dr. Robert Cargill of the University of Iowa. At several points, he offers an, um, novel interpretation of Scripture, only to be followed by fellow scholar Dr. Ben Witherington of Asbury Theological Seminary, who disagrees with him. Being the resident skeptic appears to be Cargill’s self-proclaimed function. Lent is a favorite time for TV networks to run Christian-themed programming, often with a strong undercurrent of doubt and skepticism. They love to draw in the Christian audience but too often can’t resist the impulse to throw shade on their faith. Jesus: His Life isn’t as bad as some, and there is some lively commentary that doesn’t make you feel like you’re sitting in the back of a dusty lecture hall. But, for faithful Christians, it doesn’t add much to the conversation. For the unchurched, it does put flesh and blood on Biblical figures, and that’s a good place to start. It would be better for these folks if they watched The Bible, or Bishop Barron’s Catholicism. But, Jesus: His Life isn’t the worst thing on Christianity ever — and it’s way better than History’s fanciful drama Knightfall, the first season of which was about as much about the real Knights Templar as James Bond movies are about actual espionage. Just remember that most, if not almost all, mainstream productions about Christianity are not designed to encourage or confirm people in faith. Often, it’s just the opposite. Jesus: His Life doesn’t go that far, but frankly, I’d rather spice up my Lent by rewatching Franco Zeffirelli’s Jesus of Nazareth (here’s the whole thing) or The Ten Commandments. The Roman Empire occupies the land of Judea in a time of turbulent unrest. A simple craftsman named Joseph faces a personal test of faith in the small town of Nazareth, when his fiancée Mary tells him she is expecting a child, who is the Son of God. Joseph vows to love and protect his son Jesus through many dangers: his birth in Bethlehem, the visit of the Magi, and the flight to Egypt to escape death at the hands of mad King Herod. Some thirty years after Jesus is born, his life intersects with that of John the Baptist, a radical preaching in the desert against Judea’s rulers, including Herod’s son, Herod Antipas. John baptizes Jesus, starting his divine mission, but loses his own life, beheaded in a famous conflict with Herod Antipas’ step-daughter, Salome. Mary, the mother of Jesus, is torn between wanting to protect her son and letting him go to fulfill his sacrificial destiny when the time is right; until Jesus is thirty, only she and Joseph know his mysterious mission. Jesus performs his first public miracle at her request at the Wedding Feast of Cana. But as Jesus’ work becomes public, he puts his life – and that of his family – in increasing danger. When Jesus heals a man on the Sabbath in Capernaum, he enrages the authorities and reaches an important crossroad. A simple fisherman, Peter was Jesus’ most devoted disciple, his “rock.” But when a frightened Peter disavows Jesus three times during Jesus’ arrest, Peter despairs. The resurrected Jesus appears to Peter and restores him by commanding him to spread his gospel, and Peter takes on that mission, becoming perhaps the most important of Jesus’ disciples.